NoWritetm SD - HiSpeed write protection for digital forensics review and duplication of SD memory cards. 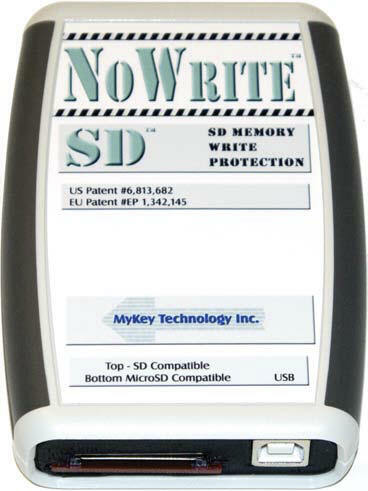 The Mykey Technology NoWrite™ SD is a hardware device that provides a write blocked SD and micro SD card reader for digital forensic review and media duplication. NoWrite SD uses the proven “Absolute Write BlockingTM” technology from the Bress/Menz design team. No other technology has been proven to provide this level of absolute protection. Nothing can be written to the SD memory cards while inside the NoWrite SD. You can only read the card, you can never write to it. After you attach the NoWrite SD to your Host computer and the target SD memory card is placed into the device, your computer will see the SD cards as protected memory. This makes reviewing standard SD, micro SD and Mini SD* memory cards easy and reliable. NoWrite SD has been tested with memory cards from 16 Megabytes to 32 GigaBytes. NoWrite SD uses the HiSpeed USB 2 standard and is backwards compatible with USB 1. NoWrite SD does not require an external power supply, making it an ideal choice for classroom work as well as standard computer forensics applications. Host computer port: USB 1, 2 or 3. Supports HiSpeed USB 2 data transfers to the host computer. Acceptable Devices: SD, Mini SD* and micro SD less than or equal to 32 Gigabytes in size. Power requirements: Standard 5V USB power through the USB port. Contact us for classroom quantity pricing. *Mini SD requires an additional adapter.